Clinton clinched the nomination last week, but DC still hadn’t voted. Now they have. Clinton got 16 delegates, Sanders got 4. Since last week when I posted the CA/NJ/NM/MT/SD/ND results, we had updates from CA/NJ/SD as well as many to superdelegate preferences. The net result of all of these was Clinton +7, Sanders +5. So net change since last week: Clinton +23, Sanders +9. All the caucuses and primaries are now over. There are still 116 superdelegates who have not expressed a preference publicly, but what they do at this point no longer matters to the nomination. Similarly, while it is possible that the superdelegates who have already supported someone could change their minds, it is unlikely to happen in significant numbers absent an earthshaking surprise. The delegate count is now: Clinton 2768, Sanders 1881, with 116 TBD. Clinton now has 59.54% of the delegates, Sanders has 40.46%. It didn’t change with the DC results since the race was already won, but here again is the “% remaining needed to win” chart. There isn’t much else to see here absent unexpected craziness. 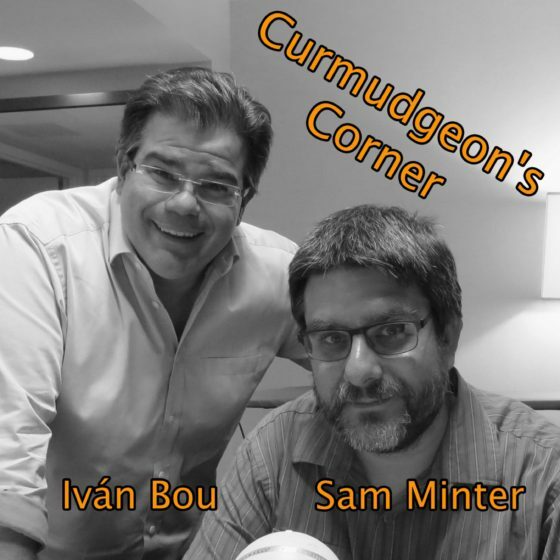 I gave my thoughts wrapping up the Democratic race last week. If there are any additional developments you will see them here. But aside from straggler superdelegates revealing their preferences, nothing of significance is expected. The Republicans are done too of course. We have Clinton vs Trump. It is time to settle down and get comfortable for the general election coverage. 146.4 days until the polls start to close on Election Day 2016. Buckle up! Update 2016-06-18 16:19 UTC – Superdelegate update: Clinton +12, Sanders -1. 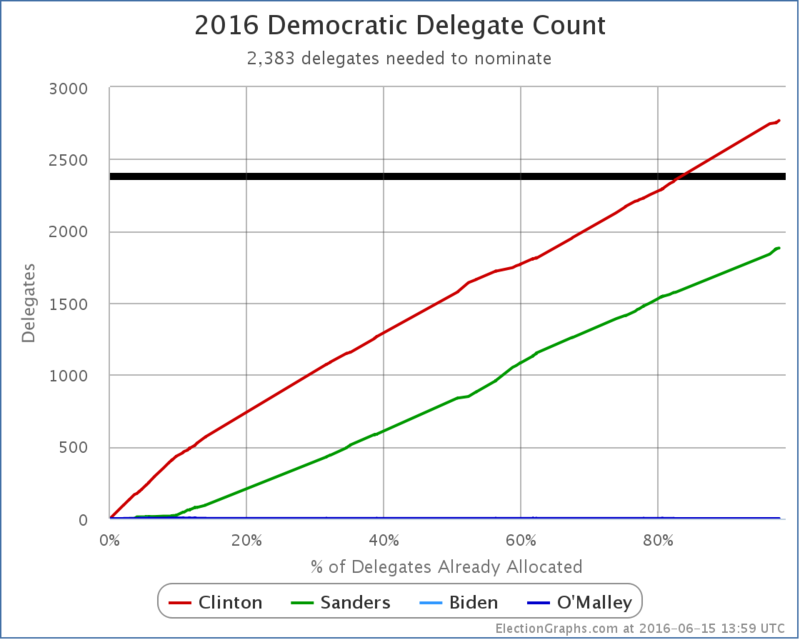 Update 2016-06-22 15:47 UTC – Superdelegate update: Clinton +3. Update 2016-06-22 15:48 UTC – Update from California: Clinton -8, Sanders +8. Update 2016-06-24 17:06 UTC – Superdelegate update: Clinton +2. Update 2016-06-28 06:39 UTC – Superdelegate update: Some shuffles, but zero net change. 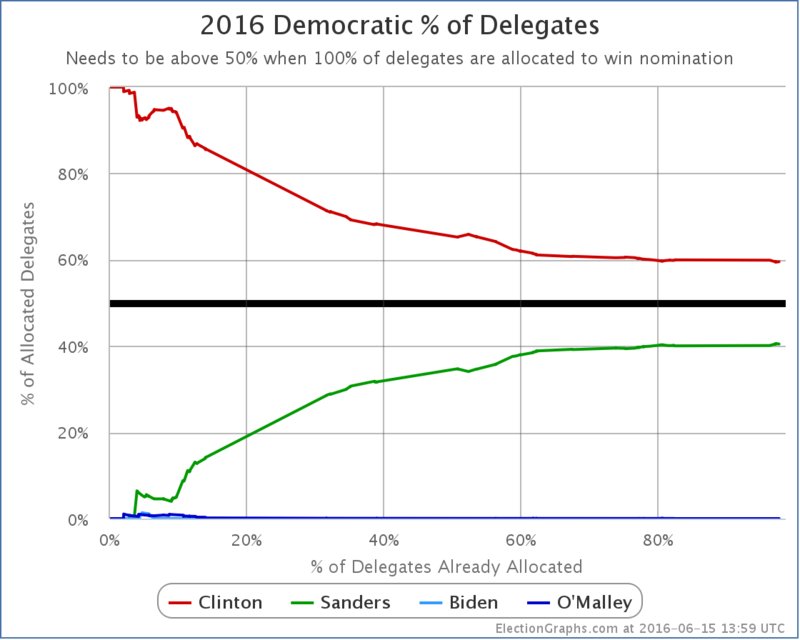 Update 2016-07-13 03:56 UTC – Superdelegate update: Net change Clinton +1, Sanders -1. This is Sanders endorsing Clinton. Update 2016-07-21 15:56 UTC – Superdelegate update: Clinton -1. This was due to Rep Takai (HI) dying, so total number of delegates also -1. 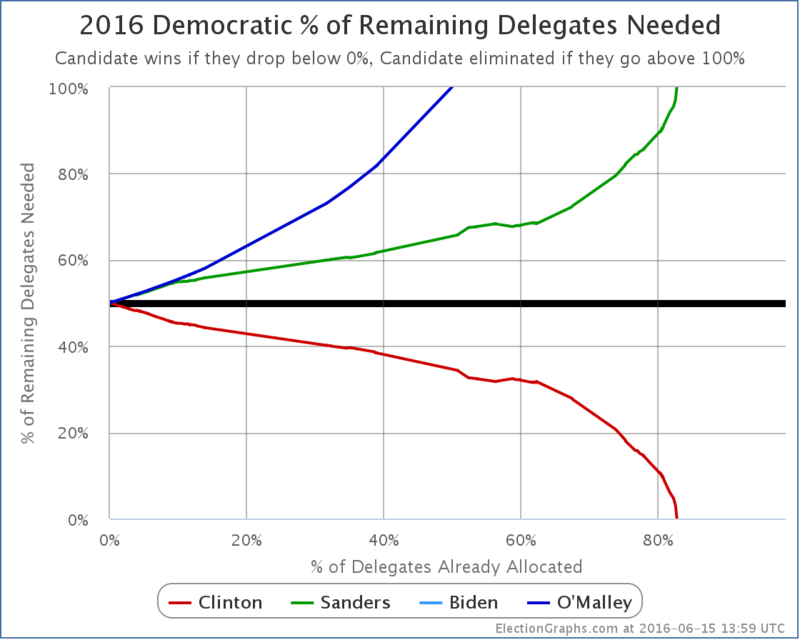 Update 2016-07-26 07:27 UTC – Final superdelegate update: Net change Clinton +1. This makes the final totals Clinton 2782.5, Sanders 1889.5. Next update will be the convention roll call. Update 2016-07-28 15:34 UTC – Actual convention roll call results were Clinton 2842, Sanders 1865, DNV 56. So Clinton gained 59.5 delegates while Sanders lost 24.5 delegates compared to the last estimates here.